A report from Australia's The Age, as well as multiple posts on Apple's Support Communities forum, confirmed a number of device owners were targeted in what appears to be a string of related "digital hijackings." As of this writing, iPhone, iPad and Mac owners in Queensland, New South Wales, Western Australia, South Australia and Victoria have been affected by the attack. 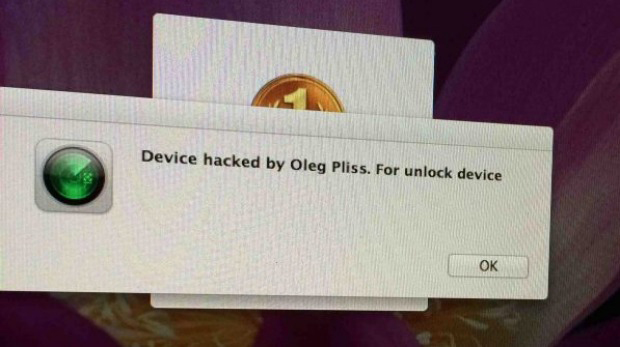 Those targeted in the attack said their devices alerted them to a "Find My iPhone" or "Find My Mac" remote lock, with many receiving an accompanying message reading "Device hacked by Oleg Pliss." The hackers responsible then directed owners to pay up to $100 for a device unlock. According to reports, the hackers appear to have gained access to users' iCloud accounts as multiple devices show the same message simultaneously. It is unclear how this feat was accomplished, though password reuse is a likely scenario. Savvy owners who set an access passcode for their computer or iOS device were able to regain control of their device following receipt of the message. Limited by design, Find My iPhone's functionality only allows users to set a password for devices that don't already have one logged. Those owners who did not set a passcode prior to the hack were reportedly unable to take back their devices. Apple provides a support page that offers a workaround to the issue, though some users may have to contact customer support to completely solve the problem. Along with protecting an iDevice with a password, owners can set up two-factor authentication, which sends a confirmation code to a trusted device before any account changes can be made.